Friday 28th September sees the opening of Merrow, a new addition to Galway’s thriving dining scene that will further enhance the city’s burgeoning reputation as the unofficial culinary capital of Ireland. Taking its name from the mythical mermaids of ancient Irish legend, Merrow is poised to elevate pre and post cinema dining to another level. The restaurant opens from 8am to 9pm Monday to Thursday and to 10pm on Friday, 10am to 10pm at weekends for breakfast, lunch and dinner. The seasonally shifting menus at Merrow bring together produce from Galway and beyond as well as making the most of foraged ingredients from the wilderness of the nearby coast and countryside. Jarovoya is reunited in the kitchen with second in command, Bronagh Beattie, offering a unique dynamic behind the stoves. “Bronagh and I became great friends while working in Dublin a few years ago”, said Jarovoja, who also worked at the acclaimed Ard Bia restaurant nearby. “Working with someone with whom you share the same work ethic and passion is a dream job”. The keenly priced food appeals to locals, tourists and cinema goers alike with the option to pop in and order anything from a coffee to a three-course dinner with children’s portions also available. A carefully curated list of cocktails, spirits, Old and New World wines, beers, craft brews, soft drinks, tea and barista made coffee are available throughout the day and night and can also be taken in to enjoy in each of the screens. Breakfast typically starts off with the likes of oat and seed granola with yoghurt and fruit compote or creamy mushrooms with poached egg and toast. Lunch features Merrow’s much ordered Seafood Chowder with brown bread or more substantial dishes like Hake with chorizo, potato and lemon aïoli. Whether it’s just a quick bite to eat before a film or spending the evening catching up with friends, dinner can be a swift or leisurely affair with starters, mains, sharing platters and dessert. The new menu is a comforting proposition for the dark nights ahead; confit duck with figs, rocket and pomegranate salad or an Angus Steak with mushroom Wellington, chard and jus. Finish with the now signature must-eat: a dish of chocolate, popped corn and caramel that is a sophisticated nod to the restaurant’s cinematic setting. 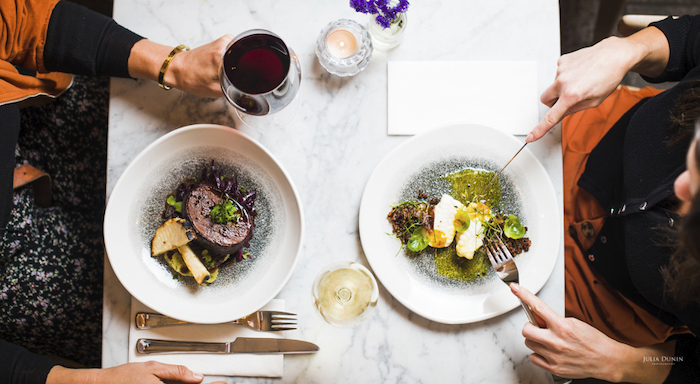 At weekends, the focus shifts to an unhurried brunch available from 10am to 5pm with the likes of Kelly’s Black Pudding, poached eggs, spuds and relish and beetroot Bloody Marys - the perfect start to an indulgent afternoon catching up with the latest releases. Andrew Lowe, Element Pictures said, “Since opening in February, Pálás has been embraced by Galway audiences and we are delighted to be now launching Merrow led by the brilliant Liga Jarovoja and Bronagh Beattie and their able team. Their talent, skill and passion will deliver an amazing dining experience and immeasurably enhance a night out at Pálás for Galwegians and visitors alike”. ABOUT PÁLÁS Occupying the site of a former 1820s merchant’s house and designed by award-winning architect Tom dePaor, Pálás is a soaring, seven-storey monolith comprising a three-screen independent cinema and ground floor restaurant and bar, Merrow. Set right in the heart of the atmospheric Latin Quarter, a stone’s throw from Spanish Arch and the banks of the Claddagh River, Pálás presents acclaimed new and classic films along with the best of Irish and International independent cinema. To book a table or to find out more call 091 394 076, see www.merrow.ie or get social.